"For all have fallen short of the glory of God." (Romans 2:23). It seems a bit complicated, but not really. Please refer to my story, my heartfelt poem, "Not A Saint" from Oct. 21, 2015, where I remorse in my own frailties. In this poem, I relate a need for forgiveness and how blessed others are who have found freedom to walk in the Light of Christ. As citizens of Saint Andrew United Methodist Church, who is this Saint we are named after? What is his legacy and his background, that we should be the saints of Saint Andrew? 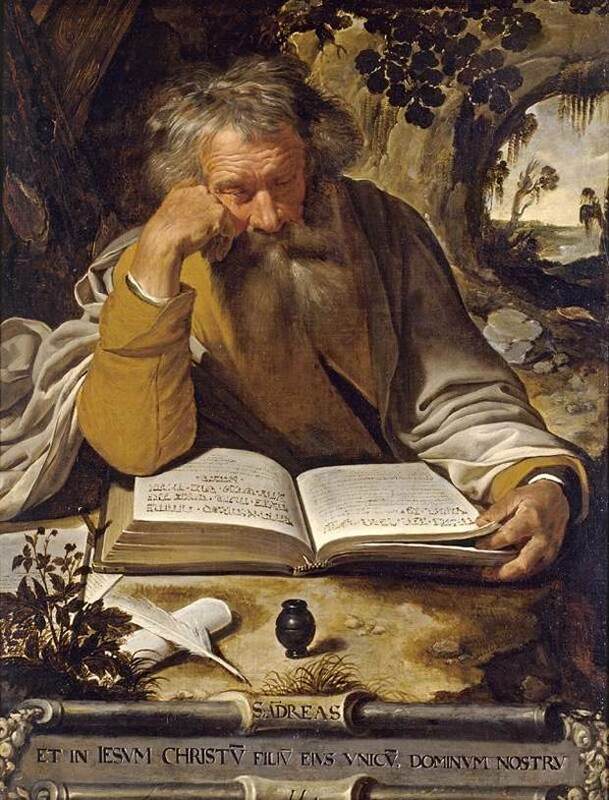 St. Andrew was a fisherman who lived in Galilee during the time of Jesus. He often followed John the Baptist and listened to his teachings. One day, John saw Jesus walking along the road. John said to his followers, "Behold the Lamb of God." He told his followers to go and talk to Jesus. He wanted them to know that Jesus was the One for whom they had been waiting. Andrew and another disciple followed Jesus and spent an afternoon with him. Early the next day Andrew found Simon Peter, his older brother, and told him, "We have found the Messiah." Both men gave up their work as fishermen to become apostles of Jesus. Andrew was one of the first to be called. He seemed to take delight in bringing others to Jesus. Andrew was the one who told Jesus about the little boy who had the loaves of bread and the fish, the beginning of a meal that fed more than five thousand people. It was Andrew and Philip whom the Greeks approached when they wanted to see Jesus. These events indicate that Andrew was a man who was easy to approach, a man you could trust. Like the other apostles, Andrew became a missionary. He preached about Jesus in the area around the Black Sea. Tradition tells us he preached in northern Greece, Turkey, and Scythia (now the southern part of Russia). Andrew died as a martyr. Tradition says that in Patras in Greece he was tied to a cross shaped like the letter X. Ever since then, a cross in the shape of an X has been called St. Andrew's cross. The name "Andrew" is a Greek name meaning "courageous" or "manly." St. Andrew lived up to his name. It's my desire to follow the example of Andrew and "be a helper" to Jesus who is easy to approach, is able to relate with the common person in love and compassion and let them know by deed and example that indeed we have found the Messiah!